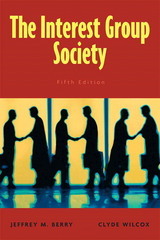 Interest Group Society, The 5 Edition Considered the gold standard on interest group politics, this widely-used text analyzes interest groups within the intuitive framework of democratic theory, enabling readers to understand the workings of interest groups within the larger context of our political system. Comprehensive coverage includes not only the traditional farm, labor, and trade associations, but also citizen groups, public interest organizations, corporations, and public interest firmsBrief in page count yet comprehensive in coverage, the book is flexible for different class settings. The book's rich content and lean size allows it to stand alone as the centerpiece of a course, or be assigned as one of several texts.